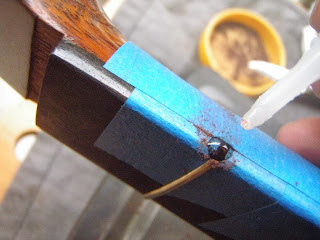 This post is a bit of a follow-up to the post about installing frets in an acoustic guitar (here: http://diystrat.blogspot.com/2013/06/refretting-acoustic-guitar.html). You see, in this post, we’ll be covering filling the little holes left at either end of the fret slots after you install new frets. 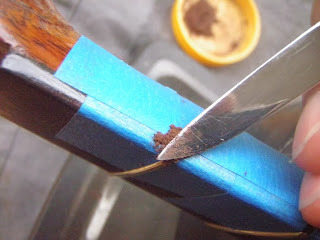 This isn’t an entirely necessary job and a lot of people would probably be happy to stop after installing the new frets. Playability won’t be affected at all, but it certainly makes things look a bit tidier if you do this after a refret. Firstly, let me show you what I’m talking about. 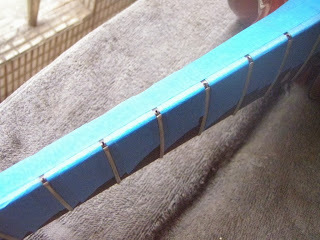 These frets have just been installed. 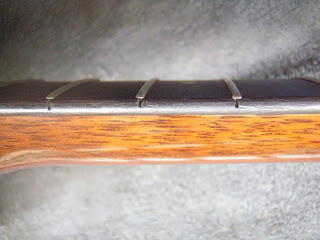 As you can see, there’s a little gap in the wood at each end of the fret slot now. When we sanded the fretboard down while doing the refret, we made sure to save the rosewood dust. 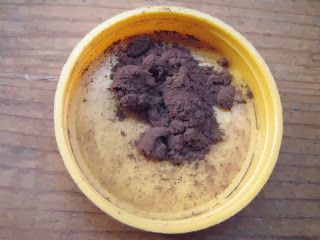 This (and some super glue) is what we’ll use to refill the holes. 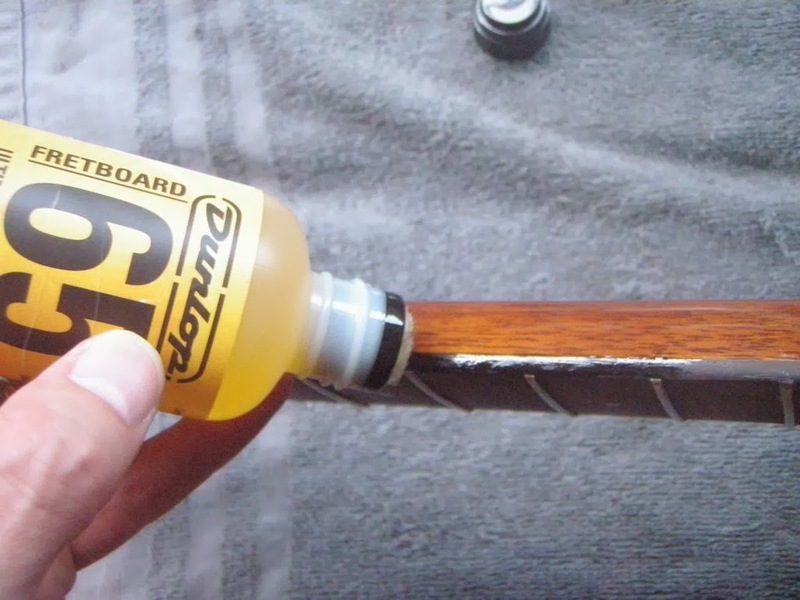 After removing the strings, we mask off the neck so that the glue doesn’t go anywhere it shouldn’t. 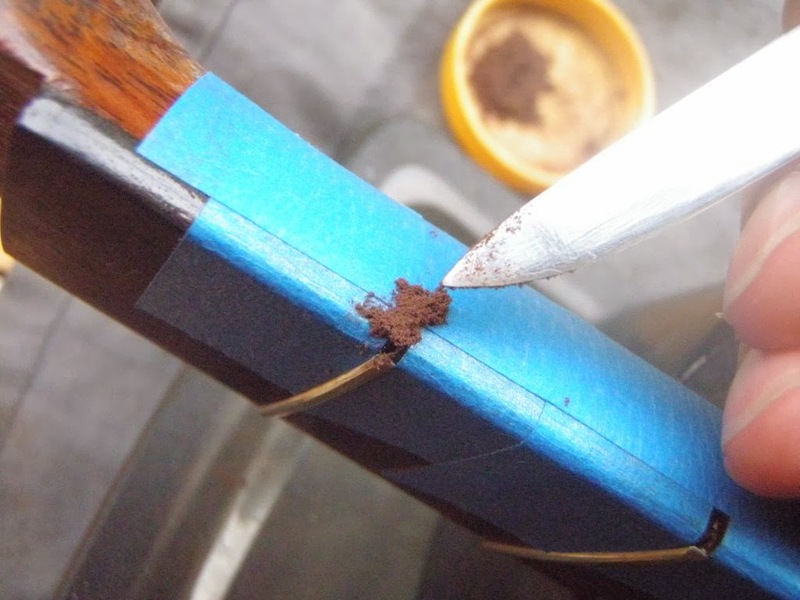 I’ve used painter’s tape here, but I’d recommend using electricians tape usually, as it’s a lot less likely to be affected by super glue (more on that later). You will see that we have masked one side only. 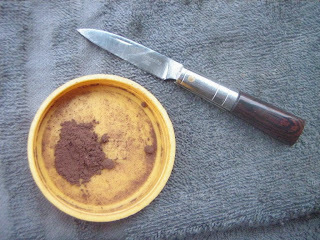 This was a time thing, the details of which I won’t go into, but normally you’d want to mask both sides at the same time, just for the sake of efficiency. 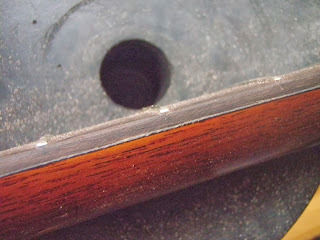 With the holes angled up the way, we pick up some of the rosewood dust and pack it into the hole. After brushing off any excess powder (ideally you can put this excess powder back into your store of rosewood powder), we saturate the remaining powder with super glue. 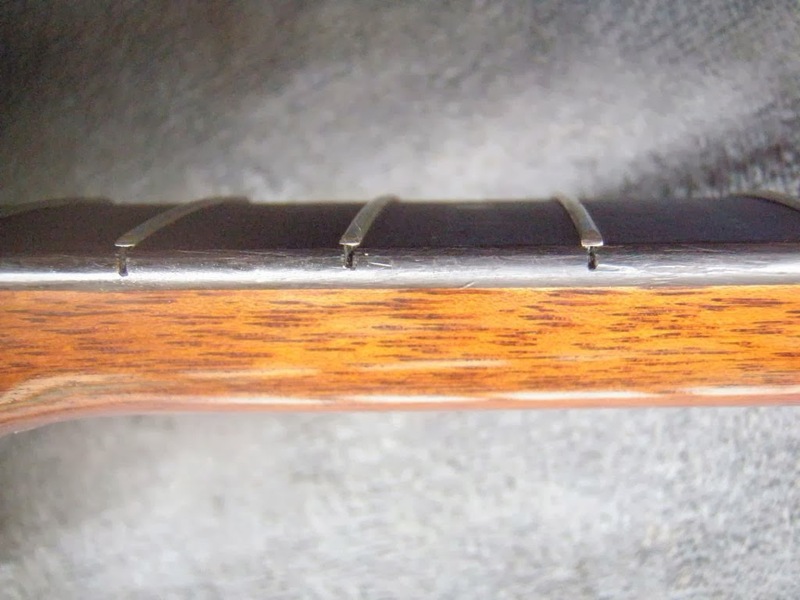 Be careful not to add so much that it starts running down your guitar neck. At the same time, make sure it’s enough to saturate the rosewood dust and not just sit on top. Now, it’s not the end of the world if you let the super glue dry completely, but I’d highly recommend that you (carefully) remove the masking tape while the super glue is still tacky. Otherwise, you might find yourself having to deal with stuck-down tape in places (as alluded to earlier, electrician’s tape is a bit more forgiving here). 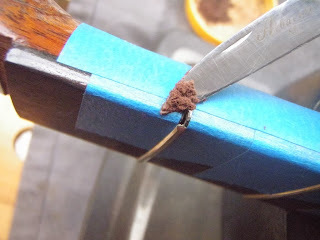 Once the glue has completely dried, it’s time to file off any excess. 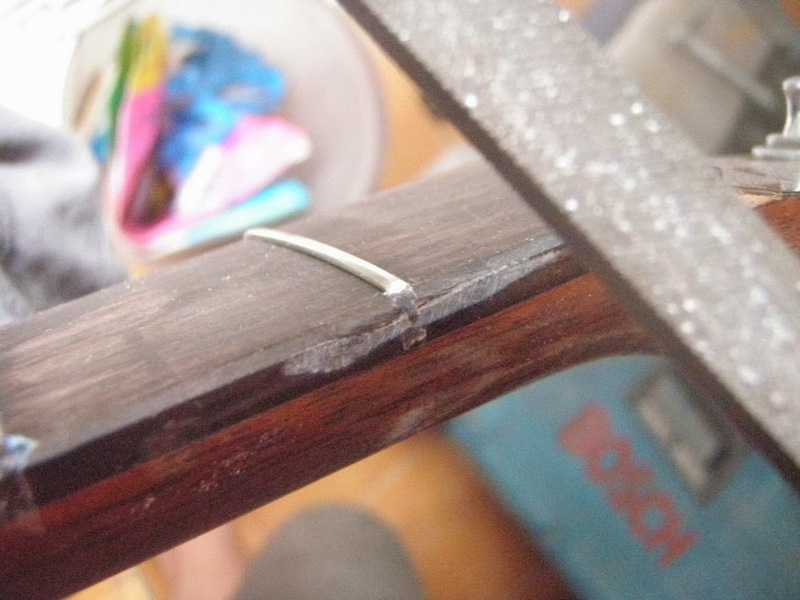 Make sure you file away from the fret ends when doing this, otherwise you might inadvertently lift a fret. On this particular guitar I’ve decided to remove any and all lacquer from the rosewood along the sides of the fretboard (which would match the exposed rosewood on the face of the fretboard), although you could always re-lacquer it if you were so inclined. 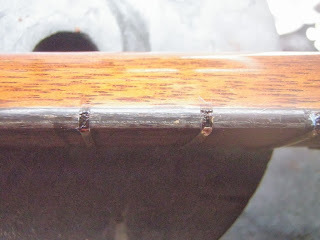 I’m adding a little bit of lemon oil here to give the rosewood a bit of a shine, but will leave it there. Hope you like your dinner. It was a great talk earlier. Hope we can talk lot about music in future time! 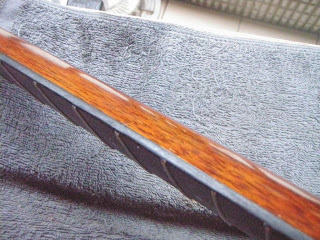 Looks really good, I've got an old epiphone from the 70's I'm thinking about refretting & that filler you did looks excellent.